many thanks for task 27. You can find my reflections below and then the instructions for Task 28.
the posture shown in both pictures is Virabhadrasana I (Warrior I). the posture in the left picture is a variation of Virabhadrasana I, whereas the posture in the right picture is the ‘classic’ pose. 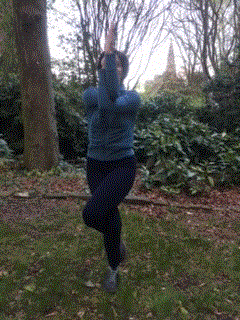 the posture on the left is a bad version of Virabhadrasana I, whereas the posture on the right is done ‘correctly’ (or at least this is the intention). the posture on the left is the original Viravhadrasana and the posture on the right is a later, more athletic, development. the posture shown in both pictures is Garudasana (eagle pose). the posture on the left is a variation of the posture on the right. there is no connection between the two postures. It is funny that in some ways I started doing task 27 before you set it for me. On Sunday the 22nd of April I went to a yoga class after 7 years. It also happened that this was the first non-Iyengar yoga class I attended in 19 years. I enjoyed the class a lot, but I often caught myself thinking ‘this is not yoga’. Of course, since I had not attended any classes for 7 years, it is highly likely that I am out of touch with developments in the curricula, let alone the emergence of new schools and approaches. Then I received the instructions for Task 27 and I decided to attend the same class again and try to capture how what I was being taught mapped onto what I knew already. And the answer is that the relation between the two is neither direct nor definitive. Yes, both the thing I know and the thing I encountered the last two Sundays are called yoga; yes, we all had a mat and a bolster; yes, we all placed ourselves in neat lines and a teacher sat in front of us; yes, there was reference to a set of postures I knew already and invocations of OM. But apart from that the class was very very different to everything I knew. Which is very annoying for someone who is tasked with finding the ‘right’ posture. Moreover, I feel that your question about the conditions under which a posture is right, as opposed to ‘wrong’ is at the heart of a larger question: what is yoga? And I mean the question in two ways: what is this thing called yoga? Which of the things we know and do would count as yoga? To this question, one might say that the postures – their shapes, their lines, angles, duration – is less important and what counts more is the intent, the frame of mind with which one practises these postures whatever they might be. In fact, in its aphorism of yoga, the Archbishop of Albania, Anastasios said precisely this: ‘in the same way that genuflections are not simple movements of the body, but they are related to a wider belief system and express a specific attitude and psychic disposition that has a spiritual purpose, in the same way – as far as this kind of comparisons can be made – the more complex yoga exercises are related to Hinduism and aim towards spiritual, religious experiences’ (quoted in Savvidis, protothema.gr, 21/06/2015, translation from Greek mine). I, on the other hand, don’t. 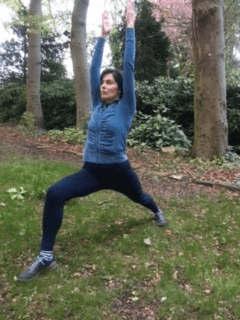 And I don’t even know to what extent the rightness of the posture matters in the end and to whom…When we do a posture badly, do we still practise yoga? Can we practise yoga without doing any postures at all? Does the practise continue when we get off the mat? When does yoga begin and when or where does it stop? So, with these questions in mind, I invite you into Task 28. Your task this week is to practise as many postures as you can in public and/or social settings as inconspicuously as possible. So you have to find ways to do postures of the existing syllabus in public places but in way that allows you to merge with your surroundings and thus preventing others from recognising what you do as ‘yoga’ or indeed as anything else other than what is expected in the specific social situation you will find yourself in. Pay attention to the moment you start the practice of each posture and the moment the practice comes to an end. Your reflections on the task can be in any form. This entry was posted in My training, Two Trainers Prepare by Maria Kapsali. Bookmark the permalink.